You're Next was directed by Adam Wingard and will be released this Friday on August 23rd. The film is about a family under attack during their wedding anniversary getaway. The mysterious killers that attack the family soon learn that one of the victims may have a secret talent in order to fight back. Guys, I'm going to be honest...I'm not convinced with this film. It seems a bit typical, like we seen it one too many times. It reminds me of Funny Games, The Strangers and The Purge....ugh, should I go on? Maybe I'll be surprised with this one but I'm not too sure! Anyhow, below are some images to check out! Anyone looking forward to this film? 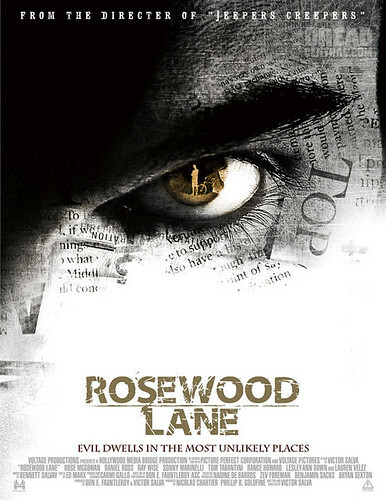 Rosewood Lane was directed by Victor Salva and released in 2011. The only question I have for this films is, "What in the holy FLAMING pits of hell was that?!" I had this movie on my Netflix instant queue. Unfortunately, I decided to watch it. It took me about 3 days to COMPLETE! I fell asleep on it twice, and when I was awake, I had to take breaks to get through it. It was exhausting, not only to my eyes, but also to my SOUL. Dr. Sonny Blake, the radio talk show psychiatrist played by Rose McGowan, moves back to her childhood home after the death of her father. As she begins to settle in, she finds herself being tormented by the local 38 -year-old paper boy. The paper boy is blatantly ridiculous. Throughout the WHOLE movie he looks like a sneaky toddler who took a dump on himself and insisted on jumping around, scheming his way to sit on your lap. Also, this ridiculous paper boy occasionally opens his eyes really wide and rolls them to the back of his head--which is supposed to frighten us. Yes, supposed to! All it received from me was a yawn and another page flip through my new ELLE magazine. I'll stop right there to NOT give spoilers. This movie was boring, predictable and ridiculous. It wasn't scary at all though it tried to be by playing intense music which didn't fit the scene. I haven't noticed this before, but Rose McGowan is a HORRIBLE actress! I understand she was in a car accident and she had surgery done to cover up the scar under her eye, but it looks like she has done more than that. I was so distracted by her non-emotional, blank-stare face. O_O She kind of looked like she was in pain. I'm not trying to be mean...I know I'm not the only person who noticed this! I personally thought she was beautiful the way she was! LIKES! There were hints that Derek could possess some sort of supernatural entity which was awesome. I also liked how the action takes place in the suburban neighborhood, mostly in Sonny's home, which could be a horrifying situation! I loved how Lin Shaye made a short appearance. Whenever she's in a horror film, no matter how small her role, she always adds a hint more of eeriness. I guess Rosewood Lane would be good for people who want a safe thriller since this film doesn't break any boundaries or push limits in any way. If you have nothing else to do with your life or feel you have nothing else to live for...I say give it a go. You may enjoy it! 1 out of 5 queen skulls! I just wanted to share my FIRST editorial piece that's featured on Bloody-Disgusting! Bloody-Disgusting is one of my favorite go to sites so I thought it was pretty awesome that I was able to featured on such an awesome site! Check it out and let me know your thoughts! Enjoy!